For this tutorial, we are going to use the free edition of Virtual DJ. However, to stream for longer than 10 minutes, you require a paid version of Virtual DJ. You can download Virtual DJ from the Virtual DJ website. a. Under Virtual DJ's decks, click "RECORD", then click "BROADCAST". 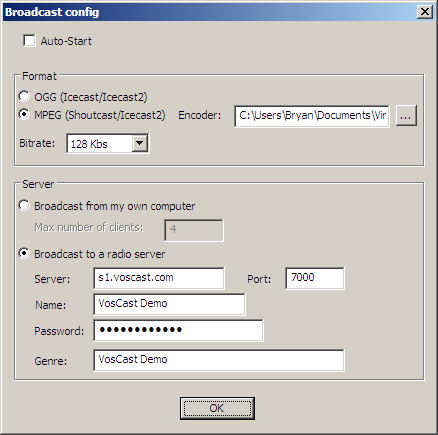 c. Under "Format", tick "MPEG (Shoutcast/Icecast2)". Change "Bitrate" to match your server's maximum bitrate. Under "Server", tick "Broadcast to a radio server", then fill in your server details into the fields below. 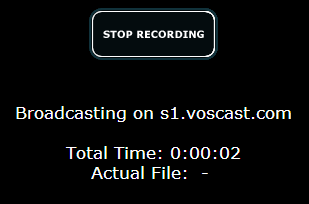 d. Click "OK", then click "START RECORDING". You should now be connected and streaming to your server.